Somerset Rebels Speedway Official Website: IT'S A COW-ASAKI! It has not been uncommon for speedway riders to be presented with a new bike to honour their success, few though have been presented with their own piece of livestock, but that is precisely what the Mayor of Burnham-on-Sea & Highbridge, Bill Hancock did at the Somerset Speedway annual presentation evening! 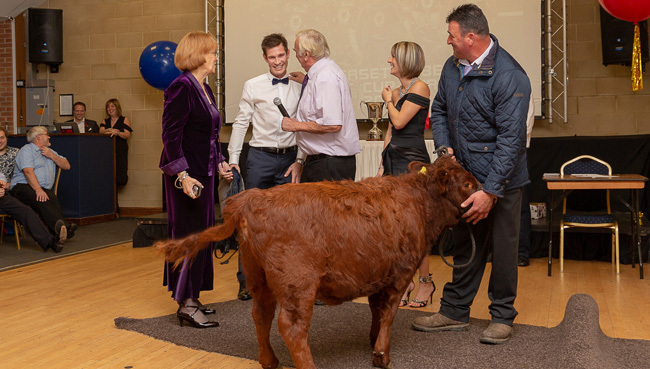 Bill, who owns the Somerset Rebels made a special gift to the club's number one Jason Doyle on Friday as he handed over "Nora" the Dexter cow to Doyle and his wife Emily, complete with the JD#69 jacket! Whilst Emily appeared somewhat perturbed by the new addition to the Doyle household, Jason the 2018 Premiership Riders' Champion and winner of the 70th staging of the prestigious Czech Golden Helmet, who led the Rebels to Knockout cup glory instantly took an affection to the animal but insisted in renaming it Deborah - much to the amusement of the Mayor's daughter, Debbie Hancock who runs the speedway club and the hosting venue of the Oaktree Arena. In accepting the gift Jason admitted "it's like winning a GM innit! I'd rather this over a motorbike any days. I didn't expect anything like that, it's the best day of my life!" and when prompted by MC for the night Spencer Bishop that maybe meeting his wife was probably THE best day, Doyle immediately quipped "No! this is even better!" Doyle was voted the Rider of the Year and also scooped the fastest time of the season.